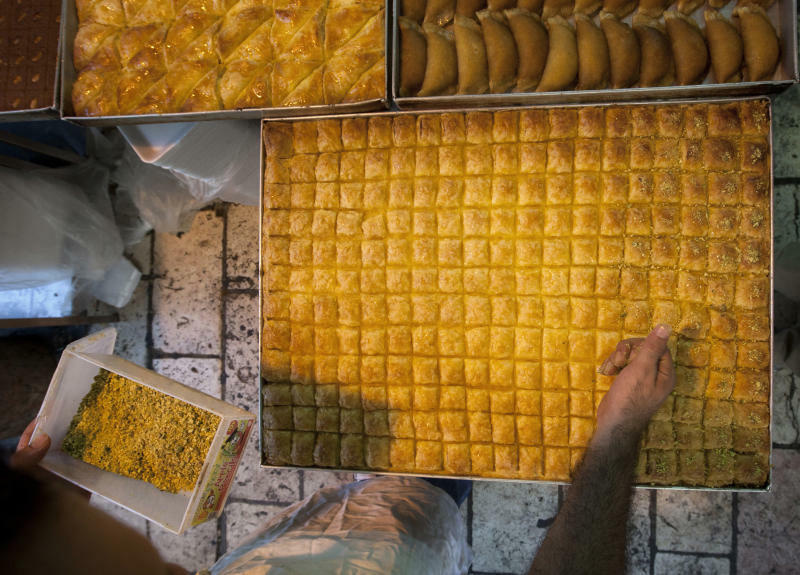 RAMALLAH, West Bank (AP) — Alongside hundreds of millions of Muslims observing the sunrise-to-sundown fast of Ramadan, a minority in the community goes underground each year during the holy month, sneaking sandwiches and cigarettes when no one is looking. They include Muslims ambivalent about their faith or outright atheists, nicotine addicts too hooked to quit for 15 hours straight or those who simply don't want to deal with a day of being hungry. The Ramadan dodgers indulge in secret — mostly to avoid offending those who are fasting or to avoid embarrassment. Community pressure is powerful. Many say they don't break the rules openly because they fear the disapproval of wives, neighbors and colleagues, or want to set a good example for their children. "I tried to fast, but it's pointless. I need to smoke," said Ahmed, a 28-year-old electrician, puffing on a cigarette at midday in the privacy of a windowless office in an industrial park in the West Bank city of Ramallah. He said he didn't want his fiancee or his mother to know he wasn't fasting. "I'm saving myself a headache," he said, laughing. In some places, authorities enforce adherence. Saudi Arabia threatens to expel even non-Muslim expatriates seen violating Ramadan. In Muslim-majority Malaysia, officials randomly inspect restaurants and parks and nab hundreds of Muslims every year among those eating or drinking. Usually it means a fine amounting to around $300, but repeat offenders in some states can get a year in prison. Still, the potential chiding from friends and family generally is reason enough to lay low. In Malaysia's capital Kuala Lumpur, marketing executive Amri said he eats in his car while heading to or from work and hides a water bottle in a work bag for secret sips at the office. He's an atheist but in the eyes of the law and society, he's Muslim. "I'm sure some of my colleagues also don't always fast, but it's something that nobody wants to admit. Half of it is the fear of being caught by (the authorities), half of it is the fear that people will look at you negatively," he said. Ahmed, Amri and others who acknowledged violating Ramadan spoke with The Associated Press on condition that their full names not be used, another sign of the taboo's power. During Ramadan, healthy Muslims must abstain from food, drink and cigarettes during daylight hours. The elderly, the very young, the sick as well as menstruating and nursing women are not required to fast. Ramadan is typically a joyous time. Families gather for meals at night and sit together to watch the season's best soap operas. People pray more. There's a spirit of warmth, a break from routine. For the observant, fasting is a reminder of the deprivations of the poor. It also brings a sense of community, so even many who don't consider themselves religious or slide on daily prayers throughout the year join in. 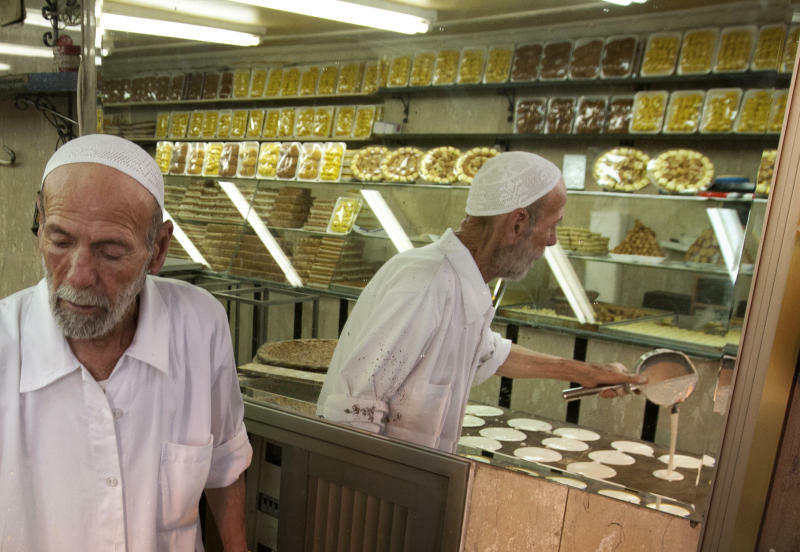 "I don't believe in fasting," said a 59-year-old Palestinian-American supermarket owner from Los Angeles. Raised near Jerusalem in a devout Muslim family, he let go of his faith after moving to the U.S. decades ago. On a recent trip back, he was reprimanded by his more devout son, 32-year-old Basil, when he unthinkingly ate cake in their car while in a traffic jam of Muslim fasters near Ramallah. "Basil smacks my hand. He says, Dad, Dad, what are you doing? You can't do that! Look at the people looking at us!" he recalled. "I had something in my mouth. I stopped chewing it out of fear. People were looking at me," he said. Chain-smoking Palestinian truck driver, Raed, 32, keeps his non-fasting secret from his four children, having his morning coffee and cigarette while they are sleeping. At the same time, he pays his sons, ages 6 and 11, a dollar for every day they fast. "I want them to be better than me," he said, sipping thick black Turkish coffee in an industrial district near Ramallah. Raed said he doesn't fast because his job is too difficult. "That's empty talk," countered his wife Nahla, 29. "It's the cigarettes that are killing him." Ramadan violators are expected to pray for forgiveness, fast to make up for lost days and give charity in recompense. Religious observance in general has increased dramatically since the 1970s in the Arab world and other parts of the Muslim world, as political Islam rose to prominence and secular nationalist and leftist ideologies faded from the scene. The rise of Islamic political parties in the region in the wake of last year's Arab Spring protests is likely to reinforce this trend, said Shadi Hamid of the Brookings Doha Center, a think tank. The intensity of Ramadan coercion varies. Most widespread is the closing of restaurants during daylight hours. Alcohol, which is forbidden in Islam no matter what month it is, often disappears during the holy month. In Ramallah, where devout and secular live side-by-side, some cafes leave their doors coyly half open, a sign that it's business as usual. One restaurant offers free soup for Muslims wishing to break their fast after sundown. Other customers can order booze. Police allow restaurants to operate normally in areas with a strong Christian minority and foreigners, such as biblical Bethlehem. Almost all bars in Egypt shut down or stop serving booze. City bylaws in Jakarta, capital of world's most populous Muslim country, Indonesia, prohibit nightclubs, bars and massage parlors from operating. In contrast, restaurants serving alcohol operate normally in Lebanon, with its large Christian minority. And then there are the places where authorities take action. In West Bank areas under the Palestinian self-rule government, police have detained 10 people for violating the fast in public, said police spokesman Mansour Khazamiyeh. Violators are generally jailed until Ramadan's end. It's also an offense in the Gaza Strip, ruled by Palestinian Islamic group Hamas, but police spokesman Ayman Batniji said nobody has been arrested yet. Egyptian Islamic clerics issued a religious ruling demanding that the government ban public eating in Ramadan, even for the 10 percent Christian minority. Similar requests were made in the past before the Muslim Brotherhood's rise to power in Egypt this year, but so far the Arab world's most populous country doesn't enforce the fast. Anyway, the biggest punishment for some is the guilt. Abdul-Latif, a 45-year-old Afghan shopkeeper in Kabul, said he and his buddies sneaked some cigarettes — but he didn't feel good about it. "It would be such a shame if my family knew," he said. "It's also shameful for me. When it becomes time to eat at night, everyone else enjoys it more than me. I know about my shame." With additional reporting by Ibrahim Barzak in Gaza, Mohammed Daraghmeh in Ramallah, Salah Sinan in Baghdad, Aya Batrawi in Cairo, Heidi Vogt and Amir Shah in Kabul, Sean Yoong in Kuala Lumpur and Ali Kotarumalos in Jakarta.